Chalcedony - it mineral, cryptocrystalline variety of quartz, consisting of the thinnest fibres, distinguished only under a microscope. 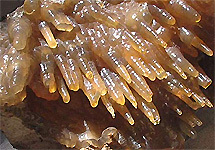 Cryptocrystalline variants of quartz are basis of chalcedonies. The name originates from an ancient city Khalkedon (Chalcedon) on the coast of the Marble sea. 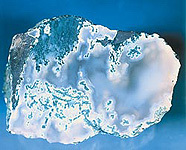 Chalcedonys is semilucent usually, examine with x-rays sometimes. Without the admixtures of Chalcedony greyish. Hardness Mohs 7, closeness 2,6. Does not form the crystals of Chalcedony. Characteristic forms of selection: veins, crusts, bud-forms, cluster-forms forms, excretions of amygdales in volcanic rocks. 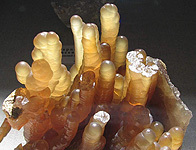 Very interesting forms - chalcedonic pseudostalactites appear on occasion. It can find out the crystalline structure of chalcedony only under an electronic microscope or expose through a X-ray radiography Roentgen diffraction analysis analysis. 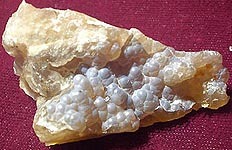 Chalcedony forms crusts, buds, spherulites, tumours. Electronic-microscopic researches allow to expose his microvillous structure. Along fibres, ductings are located, and athwart to them are layers, from rough to the thinnest (to a few thousands are on 1 sm). Often these fibres are swiped in numerous spherulites. 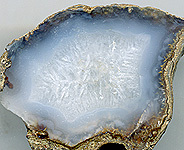 Chalcedony possesses large porosity, size of pores of approximately 0,1 mcm. 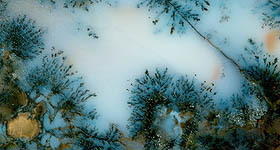 It is possible to paint over due to the presence of these pores of Chalcedony. 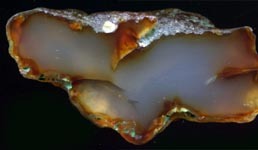 Chalcedony well accepts a polish, slightly transparent, that gives him inexpressible beauty. 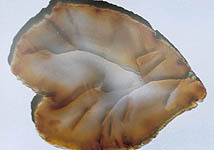 Chalcedony and especially his coloured varieties are extraordinarily widely used as jeweller-carpentry stone. The most characteristic admixtures are connections of ferrous iron and aluminium. Quartz accepts most different look, forming the large group of minerals. There is a lot of varieties of chalcedony, different on colouring and structure: pink, rose and meat-red is a cornelian (carnelian), brown-yellow, gold - sarder (sard), brownish-green, apple- or emerald-green- chrysoprase, onion-green or greyish-green- plasma, bluish-grey - sapphirine; Agate name variously painted Chalcedonys with a concentric-lamellar structure, dendragate - Chalcedony with the treelike including of oxide of manganese, an onyx is similar to the agate, but his light and dark bars of plane-parallel. Chalcedonies in narrow sense are name the stone of pale tones usually: milky-blue-sky, greenish-blue or rather yellow colors. Chalcedony (Kalkidone) as separate stone is mentioned in Apocalypse (New Testament, Revelation of St. John the Divine) at description of sthenes of the Celestial hail. Blue Chalcedonys know people yet from ancient times. Along with sardonyxs and carnelians blue Chalcedonys quite often used for making of cameos. 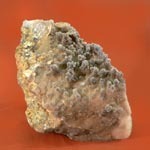 Among chalcedonies there are varieties with including of scales and dendrites, more frequent than all of chlorite, oxides of manganese or ferrous iron. Dendritovye inclusion, spherulites and scales of minerals of green color form mossy Agate, or mossiness mushroom; the patterns of chlorite in him at times have whimsical outlines and remind forest landscape, thick jungles, branches or mysterious reservoirs. Manganese dendrites of black, crutching on the cracks of chalcedony, more frequent than all are look like the branches of trees or bushes, and also educations, similar to the thin frosty patterns on glass. These stone used great success in India and other orients. At cutting try it is most beautiful to select the areas of stone with dendrites. During many millenniums from him made beads, insertions in finger-rings, pendants. Chalcedony was decorate not only clothes but also saddles, trappings, weapon. Magic of properties of stone chalcedony depend on his concrete variety. Chalcedony in a clean kind (greyish, bluish) considered the stone of love, bringing over to the women of heart of men. It is considered that Chalcedony carries in itself womanish essence, granting life and at the same time contradictory. Mongols name found in the desert of Gobi blue Chalcedonys the stone of gladness and trust that these stone are able to drive away a melancholy and create a good mood. In India, Mongolia and China blue Chalcedonys also honoured as magic stone. 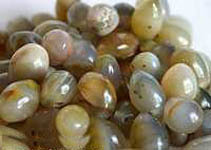 It is said in one of the ancient Indian treatises, that this stone has a color of clean consciousness. Decorations with blue chalcedonies are able to remove fear, instil a proprietor a faith in own forces. It is considered that Chalcedonys, and above all things their blue varieties, able to deliver a proprietor from the bursts of anger and attacks of melancholy. In obedience to ancient presentations Chalcedony contains the elements of air and ether, therefore this stone renders the sedative affecting psychoemotional sphere of people. Decorations with chalcedonies advise to carry people, to easily excited.